Over the last three days, I have been a privileged participant in the first stage of a developmental program for writers organised by the ACT Writers Centre, with assistance from the Australia Council. 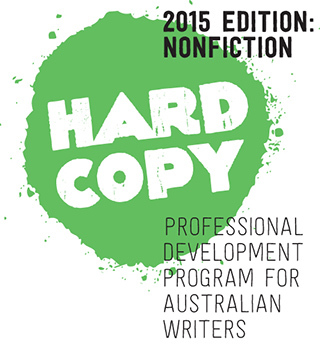 The course is called Hardcopy, and the 2015 Hardcopy was for nonfiction writers. I was thrilled to be selected to attend. There were only 26 successful participants from around Australia. Daunting. Scary. I admit to freaking out about it somewhat while driving to the venue on the first day, and my insecurity heightened as participants began to share details of their work. There are such beautiful writers in the group, such a diverse mix of ideas and experiences, so many stories and journeys to share. Once I threw my anxiety to one side, I could not help but be seduced as the magic threads of their ideas and life experiences came to life. The workshop opened on Thursday night with a keynote presentation by author and former SBS political journalist Karen Middleton. I have always been a fan of Karen Middleton’s work: she is so insightful and sharp, and has guts. And she was so inspiring. I had previously always felt a bit second best about not aspiring to be a fiction writer – not after hearing Karen Middleton speak about how people crave real stories and how truth is often stranger than fiction. The three-day masterclass itself was run by Nadine Davidoff, a talented and experienced editor. Her energy for talking about writing was unmatched – I was surprised she was not exhausted after three days of talking and motivating us. I felt so incredibly unread and now have a daunting list of new authors to checkout from my library. The structure was quite different from the types of writing-for-business-purposes workshops I have done in the past. There was not one session on grammar or punctuation. Rather it was about thinking critically about what makes a good author. What makes you want to pick up a book? What makes you then succumb into it in the battle for your undivided attention? How do authors find their own unique voice and style? And how does an author structure it all so there is an engaging topography that communicates and teases with urgency? These are questions that are easy to discuss intellectually, but much less easy to apply in practice. A bit like watching gymnastics on television, it is easy to be a couch potato critic but much harder to do the practice that is necessary to pull off a flawless somersault. On the second day we spent time reviewing each others work, and while not always a comfortable exercise to receive feedback, it was informative to see what engaged people and what needed to be darned or pruned. And from this process I also realised that others in the masterclass were sorting through similar issues about how to structure their narrative, what to say, how to say it, or what not to say. Indeed, several of us realised on the last day (during a candid sharing process that many of us referred to as ‘therapy’) that our perceptions of what our manuscripts were actually about had shifted. Sometimes the real story was not about documenting the extensive research, interviews, journals and experiences, but instead about reaching into our own souls. Or into uncomfortable aspects of our relationship with others. But the best part of the Hardcopy Masterclass? That moment when you realise you really are a writer, and the joy of being surrounded by other writers who share your passion. If you are wondering what I am writing about, I am working on turning my research and blog posts on Chinese postpartum confinement (坐月子, aka zuo yuezi or sitting the month) into a book. I feel passionately that women and Australia and other Western countries need greater postpartum support, and I hope that my writing in this area can start a conversation about providing greater society and family support for new mothers. And I also share how I survived not washing my hair for a month. I plan to publish within the year. Watch this space. I was so inspired by your energy, your passion and above all how incredibly well read you are! I will be hunting down many new authors in my library catalogue search. Thank you for your time and interest in us all. Hi Sarina, what a beautiful and accurate summary of our weekend. I so enjoyed meeting with you and hearing your story. Can’t wait to read the book! And I can’t wait to read yours – I am interested in the topic and keen to hear more. A lovely account of our workshops Serina… see you again in September! Thank you. See you, too, and good luck with getting a better bike! Happy to lend you one if you need. I even have an electric bike. Hi Serina. You described the Hardcopy weekend beautifully. I thoroughly enjoyed reliving it though your words it as I adjust to MONDAY. Uggh! Good luck with your adjusting. At least the weather would be warmer – it has turned colder here now. I took two days off work as I knew I would come away from the workshop inspired. Only managed 45 minutes of manuscript writing today (where did the rest of the day go! ), but am on a roll. I have many friends who went through the confinement after the birth of their children. I can’t wait to read your book. Every time I read your posts I keep thinking – we so need to chat! Lunch! We need to find time for lunch!! Ah, when do busy mothers have time for leisurely lunch! Definitely a catchup. I don’t have plans for Monday of the long weekend. Perhaps we could invite ourselves over? Or failing which a brief lunch. I love your comment about your best moment in Hardcopy. It was a joy to be surrounded by passionate and committed writers. Here, here!